BLAST! / Adult League Alerts! Please read this information in its entirety and Contact Us if you have any questions. Our standard means of communicating important information is via our email BLAST! and Adult League Alerts!. All captains are strongly encouraged to sign up to receive these emails, as they will be uninformed if they do not. These two free email services will provide you with all of the important information you will need regarding schedules, playoff announcements, and deadlines. Click here and follow the instructions to sign up. Many match situations or discrepancies can be resolved by referring to the Colorado District League Regulations and the Player Code. These materials are available to download on the Rules and Regulations page. We recommend keeping a copy of them in your tennis bag. Players may be added to team rosters up until your team’s last scheduled match of the season; however, they must play at least twice (one can be a 'win' by default) to be eligible to participate in Districts. Note: In the leagues that have Flight Playoffs, players must play in one match during the season (can be a win by default) to be eligible for the Flight Playoffs. Eligibility Requirements are available in the Colorado District League Regulations. All scores must be reported by midnight on the score entry deadline. Please see the Deadlines calendar for your area (part of the state) for the exact date. Unreported scores will be input as double defaults. Please make arrangements ahead of time if your match is important for standings since there is always the possibility of inclement weather. Regardless of inclement weather, the deadline for entering scores will not be extended. Click here for Information about District Championships. The dates for District Championships are all listed on the Deadlines calendar. It is the responsibility of both team captains to ensure that match scores are accurately reported within 48 hours of the completed scheduled match. This responsibility should be discussed when line ups are exchanged. Both captains should retain a copy of the match lineup and scores throughout the entire season in case of a dispute. If something is incorrect with the scores as entered, please dispute the scores and send an email (copy the opposing captain) to the league coordinator for that league to explain the reason for the dispute. All league matches throughout Colorado must play a 10-point match tiebreak in lieu of the 3rd set (Regular Procedure for all Tiebreaks - Coman is NO LONGER USED for league play in Colorado. More Info). Scores for 3rd set tiebreak must be entered as 1-0 in TennisLink. Any rained out or otherwise rescheduled matches are to be played within three (3) weeks of the originally scheduled match date or by the score entry deadline, whichever comes first. There will be no extensions for any reason. Scores not reported within that time will be input as double defaults. See the Colorado District League Regulations section 10.00 for more information. If you have questions about TennisLink, please see the help guide. • Communicate with opposing team captains each week prior to the match date. During this call/email, discuss the match location, site specifics such as water and bathrooms, plan if there is inclement weather, how many courts will be used (3 or more), etc. • If USTA Adult matches need to be staggered, please agree on which matches will be played first prior to the start of play. If no agreement can be reached, then the 3 doubles matches are to be played first. • If teams agree, and if there are courts available, the teams can agree to start the match a little early. This can help avoid darkness issues for sites that do not have lights or indoor courts. Home team captains must discuss this with their facility coordinator first to make sure the courts are available prior to 6pm for the teams to use. • When communicating with opposing captains, do not rely on voicemail messages. Make sure you actually speak to the opposing captain or have an email string that indicates that both captains have been involved in the discussion. • While everyone wants to win, make sure you and your teammates are always following The Code of Tennis. We want league matches to be an enjoyable experience for everyone involved and team captains have the ability to encourage and enforce good behavior by all of their teammates. • Both captains should keep record of the lineups and match scores for the entire season. At the conclusion of the match, agree on which captain will input the scores and which captain will confirm the scores. Scores must be reported within 48 hours of match completion. If a score is disputed for any reason, the disputing captain should email the USTA Colorado league coordinator (or area league coordinator) to inform them of the reason for the dispute. In 2006, the transition was started to provide information to captains online instead of through the mail. 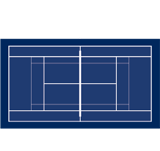 Information previously provided in captains' packets is available on COLORADOTENNIS.com and/or will be sent directly to your inbox via Adult League Alerts! for anyone who has subscribed for BLAST! and Adult League Alerts!. Due to this online accessibility, we no longer mail information to captains. It is required for all captains and players to sign up for BLAST! and Adult League Alerts! if they intend to stay informed of pertinent league information. Routinely check your email and COLORADOTENNIS.com for updates and other important information. This process has allowed us to more effectively communicate with the thousands of league tennis players in the state. If you need any assistance or have questions, please contact us. In 2012, the transition was made to email all communications to captains. Captains' letters are no longer mailed to captains. All captains should sign up to receive BLAST! and Adult League Alerts! as these communications are our primary means of emailing important information to captains and players.